Do you find yourself looking in the mirror and focusing on the bits you hate rather than the bits you love? The Skin Mass Massage Device is a highly effective massage solution which fights cellulite in all those stubborn areas that you're most self-conscious about. Incorporating the ‘squeezing rolling’ technique, this massage device stimulates the deep tissues of your skin to encourage the removal of cellulite. The Skin Mass Massage Device makes skin smoother and more even. The rolling massage helps to disperse unwanted fat which gathers around your thighs, stomach and buttocks. Programme 0: The red light comes on when the appliance is plugged in and operational. Programme 1: Makes your skin suppler and gently plumps it. Programme 2: Suction mode for better circulation and lymph node drainage. Programme 3: Vibration mode for a deep and even more pleasant massage. The Skin Mass device is easy to hold and grip due to its rounded shape and strap that keeps your hand secure. What makes the Skin Mass massage device so effective at combatting cellulite removal? Well, it lies in its squeezing, rolling technique. This is a well-known massage technique used by top industry professionals and guarantees better results when carried out regularly. With Lanaform's Skin Mass device you can enjoy a massage whenever and wherever you want to. Forget the huge price tags attached to getting it done professionally and enjoy some self-treatment in the comfort of your own home. Skin Mass has been specially designed for those areas such as the thighs, buttocks and stomach where cellulite is most prone to sticking around! To start with, we recommend using Skin Mass every day for about 10 minutes. When you begin to see results, use it approximately three times per week. Expect excellent results - clinically proven! The innovatively designed Skin Mass Vacuum Massage Device from Lanaform has been designed to treat stubborn and unsightly cellulite in the areas which make you most self-conscious while smoothing and toning your skin. A clinical study was carried out over the space of 30 days in a laboratory. It measured the level of fat loss from certain body parts and the results were incredible! The above results prove that the Skin Mass can combat your cellulite, giving you back the confidence you have longed for! Don’t fixate on the body parts you hate – take action today. 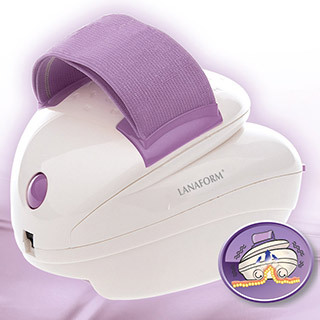 Begin to love your body again with the Skin Mass Massage Device by Lanaform.